Due to major rainfall, we have serious trail/bridge washouts between Pontotoc and Ecru. As a result, a section of the trail between Stafford Blvd. (Pontotoc Mile Markers 26/27) to Railroad Blvd. (Ecru south of Mile Marker 33 near the Ecru Whistle Stop) will be closed until further notice for the safety of all trail users. Barriers preventing access to that section are in place. There is no detour or alternate access between these closure points. We will provide updates as soon as possible. Thank you for your patience. 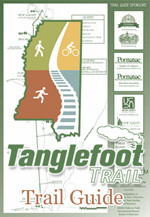 Welcome to the Tanglefoot Trail®, Mississippi’s longest Rails to Trails conversion meandering 43.6 miles through the foothills of the Appalachian Mountains in the Mississippi Hills National Heritage Area. It is here you will experience a bit of our history as you pass through fields, forests, meadows and wetlands while you travel down the path of the Chickasaws and Meriwether Lewis, or the railroad built by Col. William C. Falkner, great-grandfather of Nobel Prize winning author William Faulkner. You're sure to enjoy the slow pace of our Mississippi small towns and all they have to offer between New Albany at the northern end and Houston at the southern end. In between you’ll find that Ecru, Pontotoc, Algoma and New Houlka each provide unique characteristics. We look forward to having you visit, and hope you’ll come back often. Please visit this page for information on our Registered Trademark & Logo Policy.